Gelato Artigianale Italiano is an idea, a project building upon a long-lasting friendship and a pinch of courage. Marco and Vaghelis are two young professionals with a passion for ice-cream and pastry. Opening their own gelateria is a dream come true. Determination and an extensive training at one of the most renowned producers in Florence were essential, but it would not have been possible to open their business in Rhodes without the assistance of the Master Ice-cream maker Palmiro Bruschi. The hard work and commitment were rewarded by the excellent results achieved, many of which beyond our wildest expectations. This is why Marco and Vaghelis are willing to offer their advice to those who want to embark on a commercial venture in this sector, which represents true Italian excellence in the world. Our gelateria is Italian style! Each and every resale point has an elegant design. Our shop-fitting is both functional and welcoming. Each and every detail of the shop is carefully planned: from the quality and reliability of the equipment to the choice of the colors. We love our work. We love ice-cream. Ice-cream is more than just the sum of its ingredients. Ice-cream is the creamy union of ice and sweetness. A harmony of substance and aromas transformed by the ability of the ice-cream maker. Making ice-cream is for us much more than a business: it is an expression of the Italian culture for gastronomic delicacies. That is why we carefully select our ingredients, using fresh biologic milk and seasonal fruit. We devote our fullest attention to the process of production and the creation of original recipes. The Lab - All begins here. This is the heart of our business, built upon the experience of our team and conceived to be modern, efficient and user-friendly. 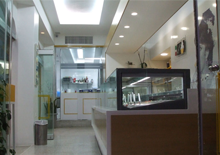 The aim of Gelato Artigianale Italiano is to combine innovation and tradition. For this reason we have selected our machines based on quality and functionality. 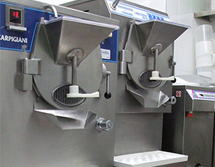 The HACCP system - Our ice cream is produced according to the highest hygienic standards. In compliance with the applicable legislation, Gelato Artigianale Italiano follows a specific method of control called Hazard Analysis and Critical Control Points (HACCP) that guarantees the safety of our ingredients and products throughout the various stages of production and distribution. Should you decide to contact us, we shall assist you also in this respect. Indeed, we will provide you with complete assistance and will help you to elaborate a clear and efficient HACCP manual. Palmiro Bruschi was born in Sansepolcro on August 31, 1967. His professional experience begins at an early age, when he trains at "Arte Dolce" in Rimini and "Cast alimenti" in Brescia. In February of 1994 he is named best Italian Master Ice-Cream maker. 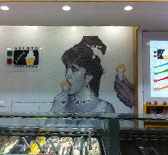 In March 1997 is becomes a Member of the Accademia della Gelateria Italiana (www.accademiagelateria.it). 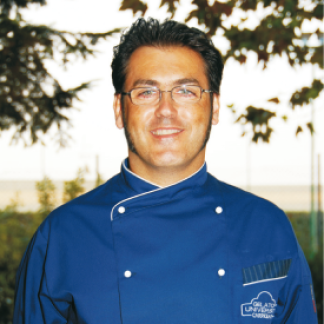 Since 2008 he teaches at the Gelato University Carpigiani. During his outstanding career he was invited to many well-known tv programmes. His work has been reviewed by prestigious newspapers and magazines, both at national and international level. He has travelled around the world acting as a consultant for businesses operating in the ice-cream making sector, as well as representing Italy from Tokio to Melbourne, from Hong Kong to New York, from San Paolo to Mosca. Feel free to contact us for a free quote. Use this form or call us! Irene B. - Roma - Italia . I really appreciate that Ice Cream, and i come from Italy.The people inside the shop gives a lot of information.So it s a fresh pause, between a beach and a cultural attraction. A fresh spot to find. Diana G. - San Diego - California USA - The gelato is amazing! My husband and I were in Rhodes for a week and every night we would stop by and have a gelato. Every day there is a new creation with fresh products. The owners and the staff are very friendly. You must try it!! Ecalcagno - One of the best ice cream of my life... I'm Italian and I know about gelato. Wonderful! Good taste and perfect service. If you are in Rodi you can't miss a trip there. The staff can help you about the island, rent car/motorbike or room. The best experience you can do there. Perfect for all situation, best after dinner. A must in Rodi. new works, ideas and so much more. NATALIA B. Если вы в любом европейском городе видите вывеску Gelato Italiano, смело заходите! Можно быть уверенным, что везде будет очень и очень вкусно. Греки тоже не подвели - в жару прекрасное мороженое-ассорти с безумным количеством разных добавок и отличные коктейли, в своей основе молочные, но с алкоголем. Пятерка!